It's time for winners!! and all of you are our winners. We are so happy with your participation in our Challenge this month! Gail please sent an email to sales@joyclair.com to claim your gift card, including on the subject September Winner. New Release Blog Hop - October 4th, 2018. Before you go remember that today is the last day of our Special Sale to celebrate National Coffee Day - ALL OUR STAMPS 25% OFF!!! See you tomorrow with our October Challenge and more news!!! 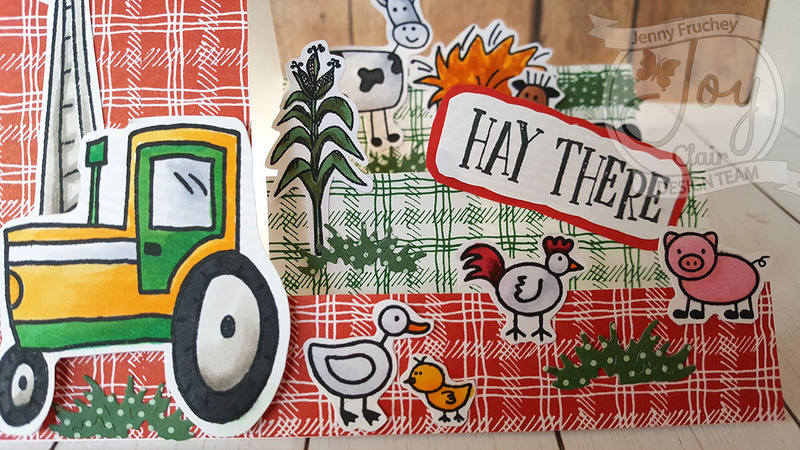 Welcome to the National Coffee Day Blog Hop with Joy Clair Stamps. Today all the coffee lovers, cardmakers and more than 30 companies are together to celebrate the day and Joy Clair Stamps is part of this celebration. Like you know, we have a special category for Coffee Themed Stamps that you can see HERE, but for today we revealed to you, our new Coffee Set, Tea Time, It's part of our incoming release. Be prepared because the new release will be up the first week of November!!! During this weekend Joy Clair Stamps is offering a special DISCOUNT IN ALL OUR STAMPS including the Tea Time!!! Just use the code: NCD25 to receive the 25% OFF in your order! Also if you leave a comment here in THIS POST and in each designer post, you will have the opportunity to participate on a raffle of a $25 Gift Card to be used in Joy Clair Store. Let the fun start and to see all the details about the cards prepared for our Design Team, just click over their names. Grab a cup of coffee and enjoy!!! We have coffee in all styles and flavors!!! If you want to enjoy the National Coffee Day you can continue HERE, and don't forget to left us your comment! Hip... Hip... Hooray... More Donuts! Hello Joy Clair friends... Helen is here. Today I have a fun, CAS birthday card that I created using the new released stamp sets called Sprinkled With Love and Dancing Donut Background. Who wouldn't want some donuts for their birthday? I know I do... These two donut themed stamp sets are super adorable and fun sets. I started with creating the watercolored look background using Marabu Art Sprays. I sprayed each color on a craft mat, sprayed with water, and then I smoosh a piece of watercolor cardstock. I dried the watercolor cardstock each time I added the color. After I added the colors, I dried the background panel with craft heater. I added the anti-static powder on the watercolored panel. This is important to make sure the watercolor panel is dried well and has anti-static powder so the embossing powder won't stick on the surface. I stamped the Dancing Donut Background using MISTI and VersaMark ink pad. And then, I added some of the Super Fine White Embossing Powder, tapped off the extra on a piece of paper, and then I heat set the embossing powder with craft heater. I cut a piece of white cardstock with Double Stitched Rectangles Dies and I added it on a A2 card. And then, cut the background panel with Oval Stitched Rows Dies and I added it on top of the rectangle mat. I used dries-clear adhesive glue for both mats. Next, I stamped one of the sentiments from the Sprinkled With Love Stamp Set with VersaFine Clair Nocture Ink Pad and using MISTI. I trimmed cardstock into sentiment banner. I added some twine at the other end and I added it on my card with 3D foam tape. Thanks for stopping by today. 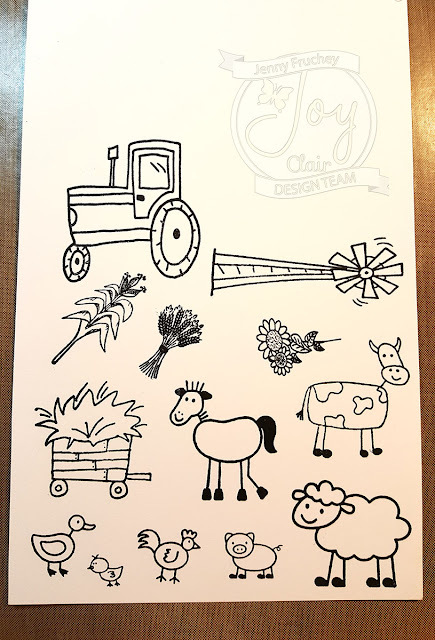 I hope you all enjoy this post and be inspired to create with Joy Clair! Hello Everyone!! It is Lindsay here from the design team and today I am so excited to share a fun FALL card using one of the newer Joy Clair Stamps "Blessed Harvest". This set just speaks to me - the sunflowers especially! It is from the Color by Faith series from Joy Clair, and can be used to create some gorgeous journaling pages, but I am using it to create an encouragement card today! So if you are curious how I create this card, be sure to watch the entire video tutorial below! I started this card by stamping and fussy cutting several images in the set. A great perk of buying Joy Clair stamps is AUTOMATICALLY receiving the SVG cut files FOR FREE!!! So I did fussy cut all of my images, because I don't have an electronic cutting machine, but know that is an option with all of the Joy Clair stamp sets! I did all of my stamping with Versafine Clair Nocturne Ink as well and used my MISTI so I could stamp several at once. I did my coloring with my colored pencils and OMS, however, this is something you can play around with. This card would be beautiful using any number of coloring mediums, just be sure to use a black ink to stamp that will play well with whatever medium you choose! I did quite a bit of die cutting for this card. I die cut a brown hill and a green hill a bit taller. I also die cut cut a white picket fence and a cloud border (from typing paper for a mask to create clouds). Be sure to watch the video above for all the details on assembling this card and finishing the inside as well! I know so many people love putting simple sentiments on the outside of their cards, but I have really been loving adding these verses from the Joy Clair Color by Faith sets to the outside of my cards! This card is the perfect fall encouragement cards for someone who just needs a little pick me up or uplifting word. So if you are interested and want to make a card just like this, you can find the supplies I used all linked below! Thanks for spending a bit of time with me today and until next time, Happy Crafting!! I am thrilled to be using one of Joy Clair's newest stamp sets, Heartfelt Sympathy, in my latest Bible Journaling page. I love a good set of flower stamps and this one does not disappoint. I not only love the beautiful flowers in this set but also all of the text stamps are so versatile for many crafting projects. This is a large 6"x 8" set. I decided to use one of the scriptures that the stamp set mentions - Numbers 6:24-26 - "The Lord bless you and keep you; the Lord make His face shine on you and be gracious to you; the Lord turn His face toward you and give you peace.” I wanted to keep this page clean and simple because I think the flowers and Scripture are simply beautiful. I stamped one flower on the bottom margin of the page and one on the top. I stamped the text stamp in the middle of the page near the scripture. I used pink and purple Neocolor II Crayons to watercolor the page from top to bottom. I stamped with Versafine Ink and the watercolors went over it beautifully. I enjoy how bold black and white look together so I decided to leave the flowers plain and not colored in. I also used the Doodle Lines stamp set to highlight around the Scripture. I put a date on the page and it was complete! I always like to date stamp my pages so I can go back and see what God has taught me and how I have grown! I love layered and messy pages, but today I created something clean and simple! It was a great time worshiping while using these stamps! How would you use this set? Jenny from Jen's Crafty Place here with a playful farm card!! 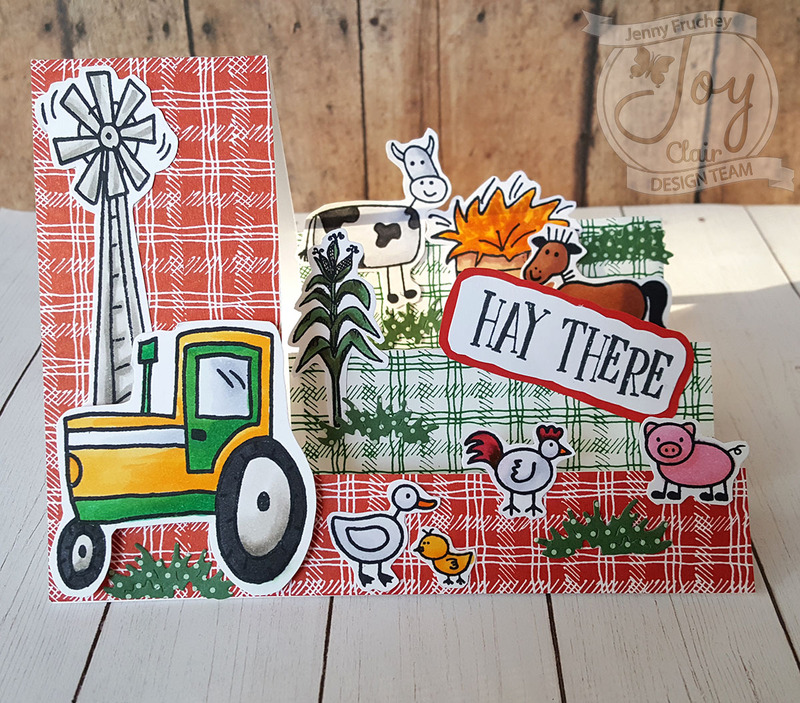 I used 2 sets from the new release at Joy Clair Stamps. You can view the entire release HERE. These are so fun!! I used "Blessed Harvest" and "Barn Party". They go together so well! 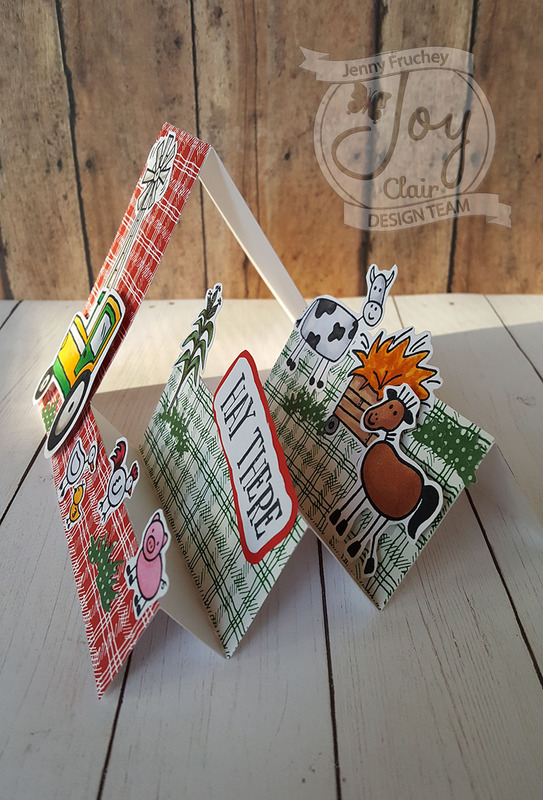 I made a side step card base with white card stock using my Silhouette Cameo 3.Then I cut out some patterned paper to fit over the panels that face forward. Next, I used some Copic friendly paper and stamped my images with Memento Tuxedo Black ink. I used my MISTI so if I didn't get a good image, I could just reink and restamp without lining them up. I then colored all my images with my Copics. After I was done coloring, I cut out all my designs with scissors. 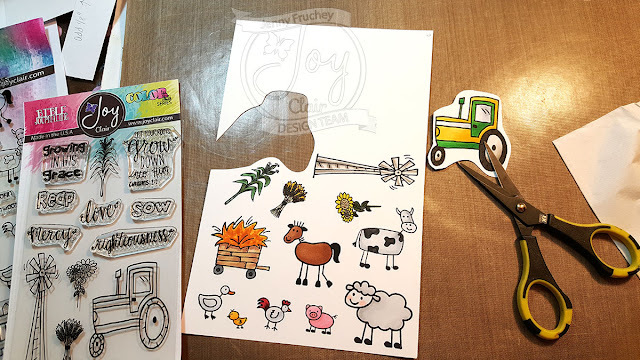 (you can also use your Cameo or favorite cutting machine using the cut files provided by Joy Clair when you purchase your stamps) I like to cut with scissors (fussy cut), it relaxes me. I set my images aside and started to design my card. I used glue and planned how I wanted to layout all my images. When I got them all glued on, I thought it needed some grass. I rooted though my die cuts and found some tufts of grass to use. I glued them around where I thought they would look best. 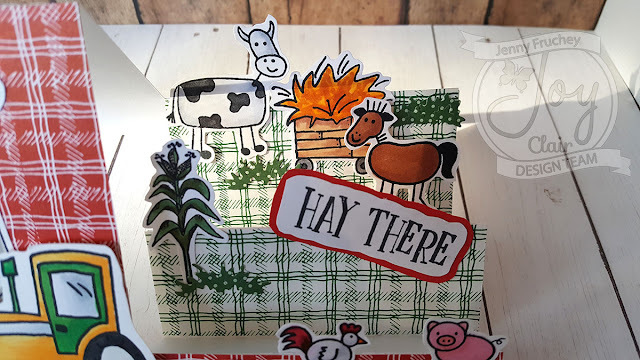 Lastly, I used the "Hay There" stamp to stamp my sentiment on to some white paper and mounted it on some red cardstock. Cut them both out and glued it to the center fold. That's it! Thank you for joining me! Don't forget to go to my blog and sign up for my email to receive all the new posts right away! Happy Card Making!! 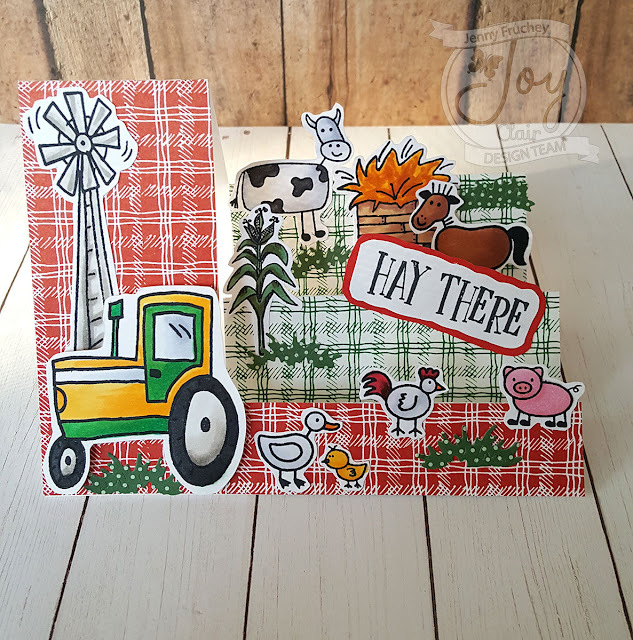 I wanted this card to have an interesting look, so I took the stamped and colored panel and used lots of rectangle dies and a tag die to cut it into shapes, borders, etc. Then I had lots of fun lining it all back up and adhering it to a black panel cut slightly smaller than an A2 card. I used a white A2 card base for my card. 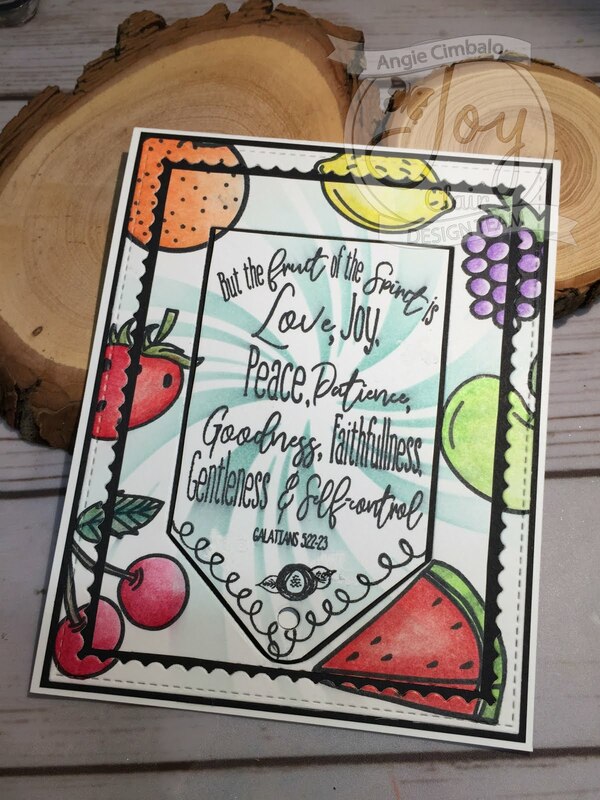 Don't you just love all the fruit images in both the Joy Clair Bible Journaling set: Fruit of the Spirit and the Joy Clair Life is Sweet sets? So many possibilities for your crafting and bible journaling projects! Hello Everyone, it's Ceal here. Today have a card using an older technique in card making but a fun one. I made a waterfall card, you can find a tutorial HERE but in case you are not a member of Splitcoast I will explain as well. For my card I used a yellow base and white as the focal panel. I stamped the Lemon/Lime images from the Life is Sweet set and colored them using Copic markers after I got them all colored I decided that I really didn't like the white background so I colored the entire panel with a teal Copic marker. You will need two colors of cardstock one colored and one neutral. Cut your Neutral Cardstock in the following measurements: 5¼" x 8" (1), 1 7/8" x 1 7/8" (4). Cut your Colored Cardstock in the following measurements: 2" x 2" (4), 5½" x 4¼" (1), 9" x 2" (1), ¾" x 4" (1). Cut the largest piece of neutral colored cardstock in half, and then stamp it as desired. Also stamp the four neutral-colored squares. Attach your stamped squares to the slightly larger colored cardstock squares. Attach the horizontal strip (the one which measures ¾" x 4") to front of card with adhesive, eyelets whatever you choose just don't put any adhesive in the middle of this piece. Next, attach piece A to the horizontal strip you just attached to the card front (you may also stamp at the bottom of this strip is you wish). To do this, slide the longest section of piece A between the horizontal strip and the card, making sure to center it in the middle of your card. Line up the very edge of the scored end of piece A with bottom of the horizontal strip and attach with adhesive. Note: the adhesive placement is very important you do not want to attach the scored side and the longest section of piece A together! Attach your first stamped image to the bottom 2" x 2" space at the scored end of piece A. 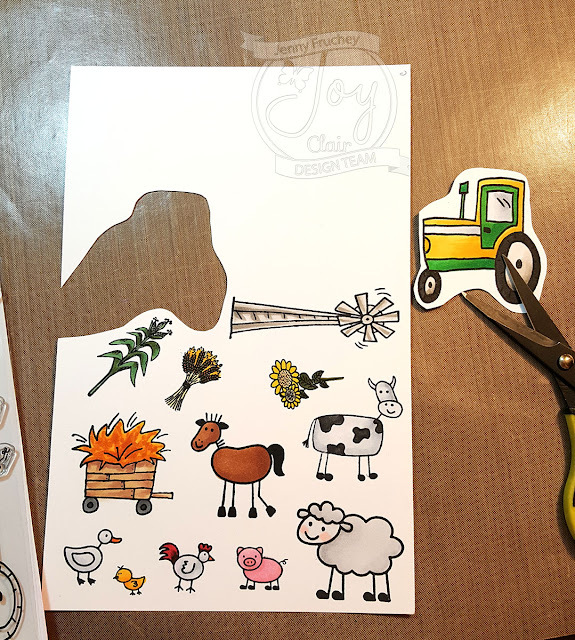 Apply adhesive to the scored sections of piece A only, and attach remaining stamped pieces. Once you've attached these pieces, you should be able to gently pull the bottom of the longest section of piece A directly down and watch the stamped images flip one at a time and then slide behind piece A. Attach an eyelet or ribbon to the bottom of piece A. To do this, simply mark where you want to place your eyelet with card in the closed position. Then pull the longest section of piece A until it is fully extended. Punch a hole and place eyelet. Thread ribbon through eyelet and tie. Trim ends with scissors. You're done! It's Donna again and I am featuring the newly released stamp set from the Everyday line called "Good Vibes". I can't believe we are almost in the Fall season, this summer was a great one for me. I hade some much fun creating my card, I love when I used distress inks and can create a scene. 7. After the glossy accents dried, I arranged the elements on my card and used some foam tape to pop the Jeep and the ball on the card. For more inspirations and updated news, make sure to follow Joy Clair on their social media platforms. You donot want to miss any upcoming events and giveaways Joy Clair may have! Thank you so much for stopping by today and please come back again soon! Hello there Joy Clair friends! It's Kerry here and today I'm sharing a few cards I created using the new Heartfelt Sympathy set. I started out by rubbing the ink off of some green Rinea foil (in the Peacock pack) with Ghost Ink onto a piece of white cardstock. I did this several times to create a fun "mountain-like" design with the ink that was rubbed off of the foil and directly onto the paper. After that, I designed the rest of my card. To finish the design, I added a fanned piece of gold cardstock, splattered some gold and cocoa ink and then stamped the sentiment with Memento Rich Cocoa ink. I tied a piece of twine onto the card to finish it off. I think this technique really helps to add some fun decor to a CAS card. And who doesn't love a bit of sparkle with some gold cardstock?! Since I had the scrap of Rinea Foil left from my previous card project, I decided to use it on the next card. I stamped the florals onto the cardstock using Desert Sand Memento ink and then rubbed some Gold Pan Pastel over the ink to give it a slight texture and the paper some awesome shimmery gold look. After that, I stamped the sentiment onto the cardstock using Rich Cocoa ink. Repeating the twine design, I wrapped it around the base of the stamped panel and tied it off into a bow. Pretty, Pretty, 'eh? Thanks so much for stopping by today to check out my creations! I hope these projects inspire you to create something fun today!